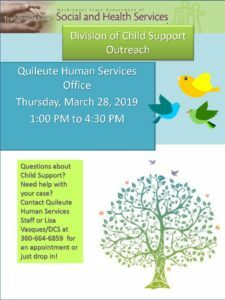 The Quileute Tribe Department of Human Services is deeply committed to providing compassionate services in a culturally sensitive manner that enhances the lives of individuals and families and the integrity of relationships. The mission of the Quileute Department of Human Services is to foster self sufficiency through our programs and services for the Quileute community by promoting individual and family healing and growth, using culturally relevant practices that strengthen and sustain social, educational, emotional, mental and spiritual well being. 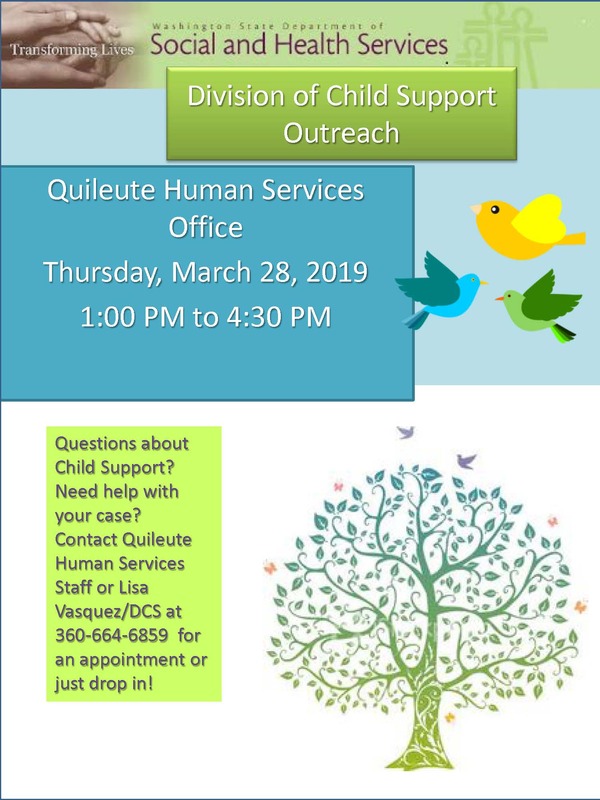 March 28, 2019 Lisa Vasquez from Division of Child Support will be available at Human Services to meet with families about their child support cases. Please contact her at the phone number below or stop by on the 28th.